Download (7.6 MB) RWCursorEditor32.msi What's new? For Windows 8, 7, Vista, XP, or 2000. Donate (via PayPal) Thanks! More information. Make your computer unique with custom mouse cursors. Create cursors for your friends and family. Learn how to design small, functional animations. Create online portfolio and get useful feedback. Cursors can also be used on web pages. Make a custom cursor for your blog and amaze your visitors. What can this cursor maker do for you? This is a standard function of every cursor maker. 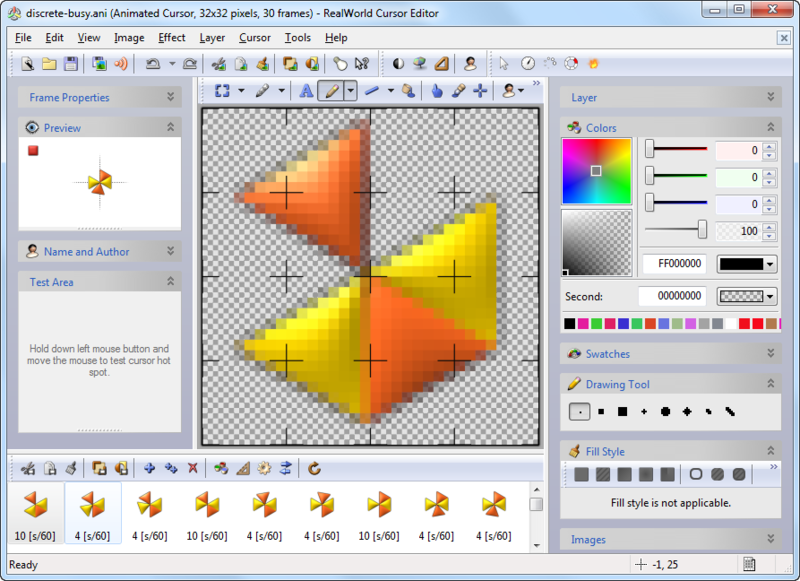 RealWorld Cursor Editor has a wizard for quick conversions and an integrated animation editor to deal with problematic images. Make cursors from PNG, JPG, BMP and GIF images. 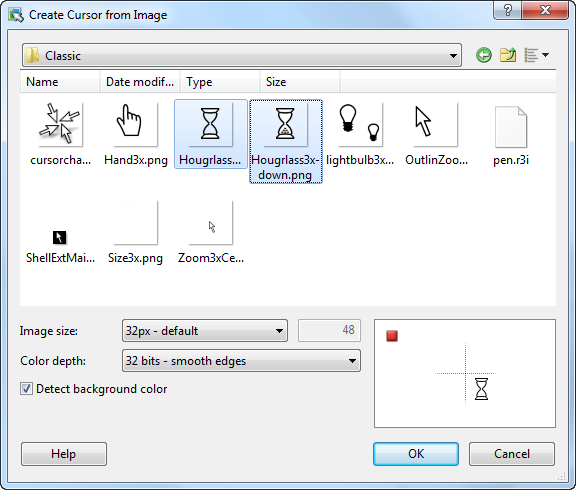 Select multiple images to create an animated cursors. Split filmstips to individual frames to make animations. to an animated cursor with two frames. 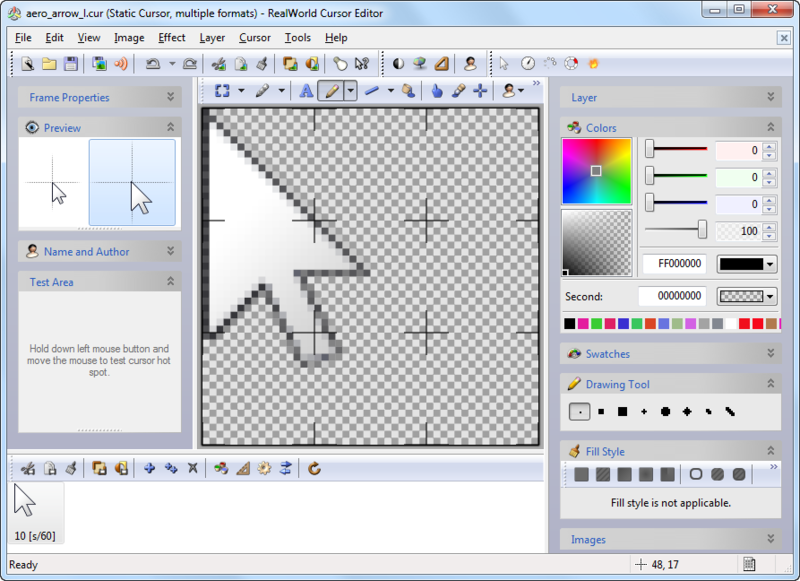 RealWorld Cursor Editor is the only tool capable of editing Windows 7 multi-resolution animated cursors. 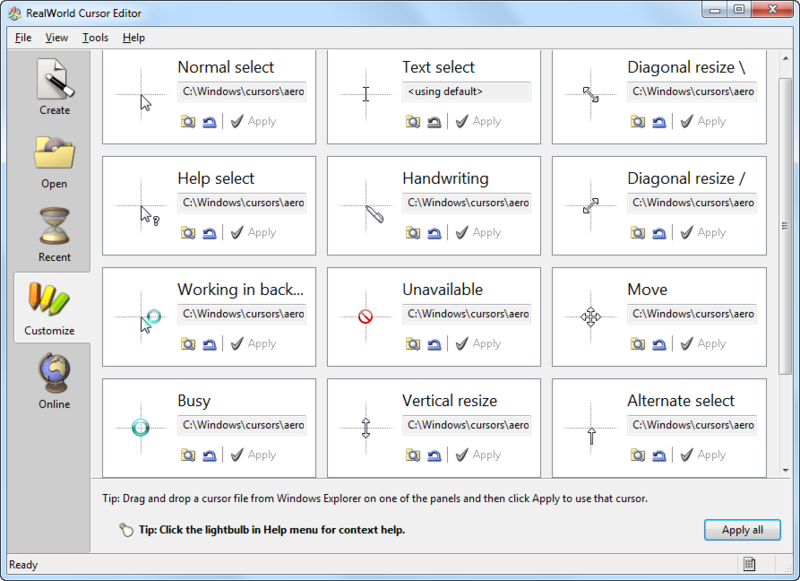 These cursors contain animation in multiple sizes and Windows 7 pick the right size depending on its DPI setting. Create multi-res cursors from images. Convert normal cursors to multi-res cursors and back. Apply effects to all frames and resolutions in a cursor. Frames in animated cursors can be moved or copied using mouse or clipboard in an intuitive manner. Appending one animation to another is a matter of few seconds. The animated cursor editor allows running filters on all selected frames at once. Setting frame duration is as easy as clicking on a frame, typing a number, and pressing Enter. Alternatively, duration of multiple frames can be changed at once using the Frame Duration panel. can be used to select, move and copy frames. Easily customize all cursor roles. RealWorld Cursor Editor gives you two ways to quickly change your active cursors. Open a cursor and make it the active cursor for selected role from the Cursor menu. Drag and drop cursors on role panels on the Customize screen and click Apply all to change all roles at once.. The program was designed to be installed by a simple copy command, there are no registry entries or system files required to run. The result is an application that can be installed without administrator permissions. A fully portable distribution (.zip) working on wide range of systems (Windows 2000 and newer) is available. 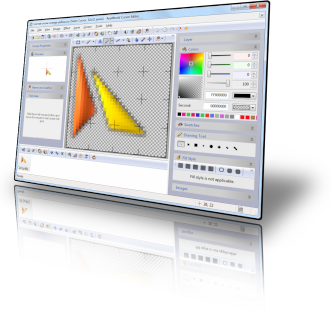 RealWorld Cursor Editor is based on RealWorld Paint and offers numerous drawing tools (Line, Ellipse, Rectangle, Pencil, Brush, Lasso, ...) and image effects (Drop shadow, Bevel, Outline, Fill, Blur, ...). The editor supports smooth selections, layers with effects and gamma-correct blending.